The Telegraph's editorial position "won't change", Sir David said. The Barclay brothers have moved to dispel doubts about their purchase of the Daily Telegraph newspaper. In an interview with the Guardian, Sir David Barclay dismissed talk of rival bids and legal wrangles that could potentially block the takeover. He insisted the purchase of Hollinger Inc - whose 30% stake in Hollinger International gives it control of the Telegraph - was a "done deal". Hollinger International is still deciding whether to fight the sale. It has set up a "corporate review committee", including boardmembers such as former US Secretary of State Henry Kissinger and senior defence official Richard Perle, to consider its response. The interview with the Guardian had suggested that under the Barclay brothers, the Telegraph might switch from backing the Tories to Labour. But Sir David later backtracked on the idea. "To avoid any confusion, we will not change the editorial position of The Daily Telegraph," he said. "The Daily Telegraph has a long established editorial position which we respect and with which we do not intend to interfere." His statement comes after he was quoted in the Guardian as saying the editorial stance of the traditionally right-wing Telegraph was flexible. Asked by the Guardian, "Will the Telegraph continue to be the house-organ of the Conservative party," the paper quoted Barclay as saying, "Certainly not." Hollinger International - owner of the Telegraph group - has called an emergency board meeting to discuss whether to oppose the Barclays' £260m bid for its parent company, industry sources say. Meanwhile, ousted Hollinger chairman Lord Black has reportedly sought an injunction against his own executives to ensure the deal struck with the Barclays will go ahead. The Channel Islands-based Barclay brothers snatched the Telegraph titles - and other newspapers including the Jerusalem Post and Chicago Sun-Times - from under the nose of rivals following weeks of secret negotiations with Lord Black. If the deal goes through it could undermine a review of Hollinger International's operations being carried out by Lazards. The investment bank is talking to potential bidders and is due to make a recommendation in March. That recommendation was thought likely to entail a sale of the company's newspaper assets, either piecemeal or as a whole. But David Barclay told the Guardian that his company's purchase of the Hollinger titles was a "done deal". He also denied claims he was paying too little for the newspapers and that the deal could be still be scuppered by regulatory problems. Until recently, it was rare to hear the phrase "Barclay brothers" without the prefix "reclusive"
"There will be no regulatory problems, none at all. It's a formality," he said. He also insisted the brothers, who also own The Scotsman and The Business, would not interfere with the editorial direction of the Telegraph. "We don't interfere. We hope our editors will reflect the feelings of the public." But he also suggested the Telegraph would not automatically follow the Conservative party line, hinting it might swap allegiances to Labour. The Scotsman supported Tony Blair at the last general election "and we were happy about that," he said. He also said he would consider following The Independent and The Times down the tabloid route. "We would have to go all-tabloid if we did it. And my young family members like tabloids. The broadsheet is associated with an older generation. So we might be forced to do it." 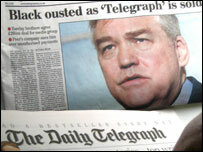 He denied the Barclays would asset strip the Telegraph, despite his reputation as a cost-cutter. "We are in this for the long haul," he told The Guardian. Lord Black resigned as chief executive of Hollinger International in November after the board uncovered $32m in unauthorised payments to him and other executives. Lord Black, who was ousted as chairman of the group on Sunday, claims the payments were legitimate. In a lawsuit brought by Hollinger International, he is accused of bullying minority shareholders and using company cash to fund a lavish lifestyle. He is also at the centre of an investigation by the US financial watchdog the Securities and Exchange Commission (SEC). Meanwhile in a further sign of the turmoil enveloping Hollinger Inc, the firm said on Tuesday that a director and member of its audit committee, Andre Bisson, had resigned - just days after joining the board. Q&A: What now for the Telegraph? End of the line for maverick magnate?